The famous Leaning Tower of Pisa captures the imagination of everyone who visits it. 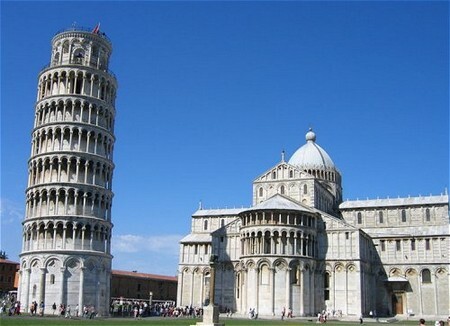 The structure sits in the Piazza dei Miracoli (Cathedral Square) located in the city of Pisa, Italy. Visitors to the monument who may not know its history may wonder why such a large undertaking shows such poor civil engineering. The Tower, considered the cathedral campanile, stands next to two imposing buildings: the Duomo the Baptistry and the Camposanto. The following illustrates the events regarding its long history. 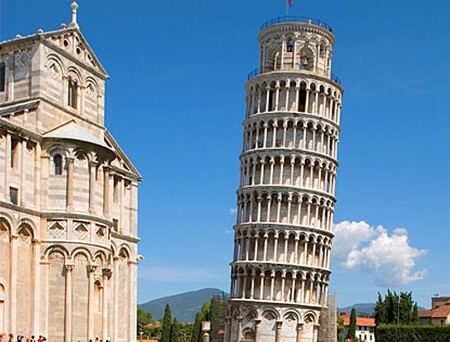 Designed in 1174 by Italian sculptor Bonanno Pisano, the Leaning Tower of Pisa began to slowly sink right after laborers started building it 800 years ago. When construction reached the third floor, the workers realized the Tower had started to lean slightly. A poor choice of location to build the Tower led to problems with the stability of the building. Due to the marshy unstable soil of the estuary on which it sits, the Tower sank so badly that leaders halted construction on it for 90 years. Ultimately completed by Giovanni di Simone and Tommano Simone, the pair placed a belfry at the top of the tower in the 14th century. The Tower then began its characteristic tilt that captured the public’s imagination. The Leaning Tower of Pisa illustrates the dynamics of a differential element that made it lean over the years. The excess weight on the different areas of soil underwent differential settlement that caused a gradual shift that continues to this day. An example of a bell tower, the Romanesque design has a cylindrical shape characterized by six open galleries. Long considered a visual masterpiece, the design is stunning. Located in galleries separated by a cornice, a series of arches adorn the capitals of the columns. Blind geometrically designed arcades line the base of the Tower. The belfry contains the same arcades with the housing of the bells inside. Due to the grandeur of the design, the Leaning Tower of Pisa became beloved over the years and a testament to great Italian architecture. In the 800 years since the Tower was finished, many architects, engineers and other great minds tried to halt the inclination. Many excavations and buildings around the tower worsened said inclination. An effort in 1934 saw engineers install a device to measure two directional tilts of the tower. They then drilled holes into the masonry foundation and injected 80 tons of grout to further stabilize it. The effort failed. The tilt sharply increased by an amount of one-half inch of movement at the top of the tower. All subsequent efforts failed to halt the Tower’s lean until efforts in 1994 started to correct the lean. In 1990 government officials closed the Tower to the public due to safety issues caused by its incline. The move caused considerable tourist revenue loss. As the Tower lean worsened, officials began to look for a permanent solution. Laying counterweights on the north side of the tower aided in its stabilization. A crew put in place cast ingots to aid the reverse of the lean further. The result of the design allowed the Tower to lean back toward the north in the desired direction. Soil extraction methods resulted in a further decrease in the Tower’s lean. As of 1999, efforts continue to correct the incline of the Leaning Tower of Pisa. The effort is complicated by the fact that engineers can’t remove the lean completely, or tourists will quit coming. There are ideas in the future to remove the water table in the ground under the structure.